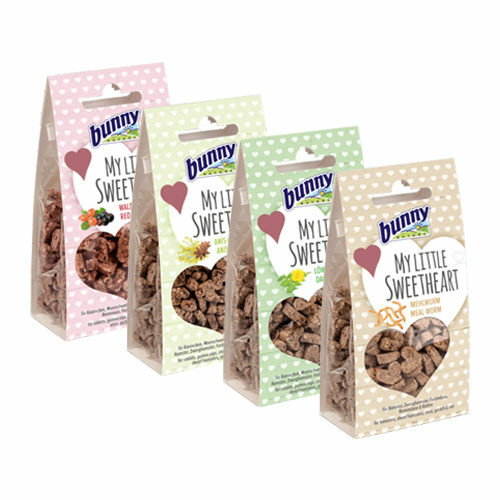 Bunny Nature My Little Sweetheart are real treats for your small gnawer. These heart-shaped snacks contain the valuable ingredient inulin, that can help to regulate the blood sugar level. These treats are made from delicious ingredients, making them irresistible to your small pet. Bunny Nature My Little Sweetheart are real treats for your small gnawer. These heart-shaped snacks are made from delicious ingredients and also contain the valuable ingredient inulin. This substance will help to regulate the blood sugar level of your small pet. These snacks do not contain added sugars, preservatives or artificial colouring. Forest fruits: For dwarf rabbits, guinea pigs, chinchillas, hamsters, mice, gerbils & rats. Meal worms: For hamsters, dwarf hamsters, mice, gerbils and rats. Dandelion: For dwarf rabbits and rodents. Aniseed and fennel: For dwarf rabbits and rodents. Forest Fruits: Hulled wheat, oat bran, rice, fruit pulp, oat bran, lignocellulose, rose hip rind (2%), elderberries (1%), hibiscus blossom (1%), calcium carbonate, chicory powder (0.5% inulin). Meal worms: Hulled wheat, oat bran, rice, fruit pulp, oat bran, lignocellulose, meal worms (1%), calcium carbonate, chicory powder (0.5% inulin). Dandelion: Hulled wheat, oat bran, rice, fruit pulp, dandelion (5%), oat bran, lignocellulose, calcium carbonate, chicory powder (0.5% inulin). Aniseed & Fennel: Hulled wheat, oat bran, rice, fruit pulp, oat bran, lignocellulose, anise (1.5%), fennel (1.5%), calcium carbonate, chicory powder (0.5% inulin). Have you used Bunny Nature My Little Sweetheart before? Let us know what you think about this product.